Peter Csaba was born in Cluj (Transylvania, Romania) of a musical Hungarian family in 1952. He studied the violin, composition and conducting, first in his hometown and then in Bucharest. After winning several national and international competitions (including second prize in the Paganini Competition), he was recognized as an artist of the first order. He has performed as a soloist and conductor with major orchestras from 50 countries around the globe. 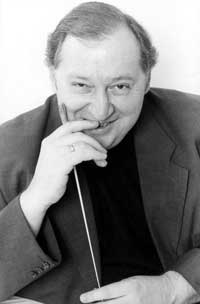 Since 1983 Csaba has been living in Lyon, France, where he has made a career as a soloist and conductor of the Orchestre de l'Opera and the Orchestre National de Lyon. From 1993 until 2002, he was Artistic Director and Chief Conductor of the Chamber Orchestra "Musica Vitae" in Växjö, Sweden. He is the founder of the Solistes de Lyon and the Virtuosi di Kuhmo chamber orchestras, and he continues to act as Artistic Director of the latter ensemble. Peter Csaba also acts as Head of the Orchestra Class at the Lyon Academy of Music. His master classes in France, Hungary, Finland, Sweden, the United States and Japan have a high reputation. He is a frequent guest at several chamber music festivals, including Kuhmo (Finland).